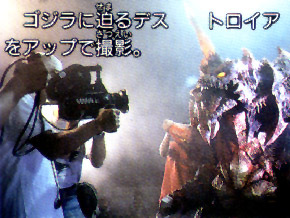 Only the Final Form Destoroyah featured a man in a suit. The rest were marionettes. There were two full size human-sized Destoroyahs, one of which later had the feelers attached for the Aggregate form. 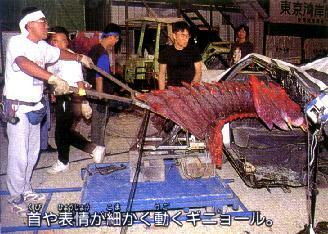 A mechanical medium Aggregate (with feelers) was used for the scene where they swarmed over Godzilla. 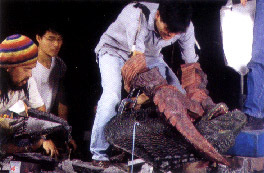 The rest of the Aggregates and human-sized creatures were either CGI or modified Bandai figures. 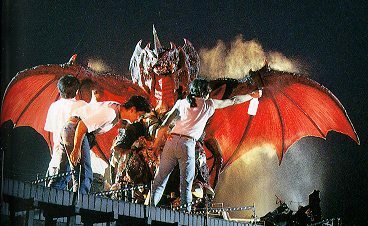 There was also a smaller Final Form model used for flying scenes (like when he carried away Junior). 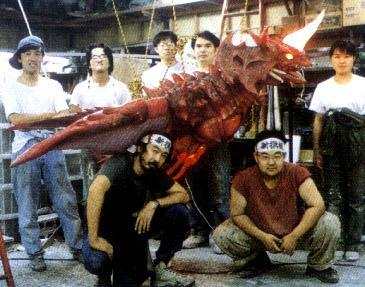 The flying form Destoroyah modeling with the crew. One of those would look so cool hanging from my ceiling. How Destoroyah attacked the Police car. Another one of my favorites. Getting Destoroyah ready to rise from the power station. Go back to Production front page.